Command v1.15.2 is now available! EDIT: we have rolled out 3 new fixes that we could squueze in before the Desert Storm release, so the patch has been updated to 1.15.2. As you probably already know, we have released version 1.15 on Steam a couple of days ago as necessary preparation for the Desert Storm release. We are now bringing the Matrix version up to speed as well! You will be able to see the Desert Storm scenarios in the game's list, but won't be able to unlock them just yet. Only a few days left, though! The game's auto-updater will also have it available any second now, if you wish to use it. * New UI feature: Personal persistent map profile (ie. maintain the same map preferences throughout different scenarios & sides, effectively overriding the scenario author's default settings). - Set up your map preferences just how you like them - range rings, targeting & illumination vectors, datalinks, reference points, sonobuoys, datablocks etc. tc. - Clicking on "Save current map profile as personal" will make the current active map profile your personal, persistent one. - Checking the "Use personal map preferences" will enforce usage of your persistent map profile. From now on, whichever scenario you load and whichever side you switch to, the map profile settings in effect will be those of the persistent one. 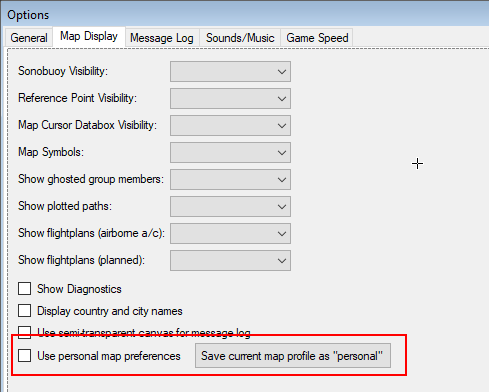 To stop using the personal persistent profile, simply uncheck the "Use personal map preferences" checkbox. The map display will immediately revert to using the settings that the scenario author offers as default for the scenario & side at hand. * The "List by group" page of the ORBAT window is now dynamic, ie. it automatically refreshes as units are added or destroyed, take off, land, deploy or re-dock to their parent, join or leave a group etc. This makes it possible to keep the ORBAT window continously open as a "running tally" (and quick-jump source) of friendly forces during a scenario, instead of a static snapshot. - Position Group/Mission to top of nodes. * When a submarine slows down in order to maintain its torpedo guidance wires intact, the word "WIRE" is shown under the submarine icon on the map. * The "Campaign Editor" window now also lists scenario IDs and enables changing a scenario's ID (In order to solve the problem where, because of duplicate IDs, the campaign flow jumps back to a previous scenario instead of just moving to the next one). - Non-imaging IR sensors make a precise detection only at distances shorter than the max classification zoom level of the sensor (e.g. if an aircraft can be classified at 5nm by an IRST, all detections at longer than 5nm will be imprecise). The range ambiguity at long range is 50% of the detection range (plain IRSTs are really bad at providing range estimates). - Imaging IR sensors are significantly more capable than their non-imaging counterparts. Like visuals, they generate a precise detection at distances shorter than twice the max classification zoom level, and their range ambiguity is 20% of the detection range. a) Straight-in: Some nations' doctrine has them follow their air-to-air missiles straight in. Such nations basically view fighters and interceptors as "flying SAM sites," and are often reliant on GCI (think old Soviet IA-PVO and still many Russian client states). They also tend to rely on large numbers to overwhelm an opponent. b) Crank (default): Other nations, typically with a more dynamic view of air combat, but with a lower degree of training or ones which are dependent on SARH missiles, will crank, but do not "drag" (i.e. run away). Eventually, this tends to result in a visual range merge (especially if the enemy beams offensively). c) Crank & drag: Other nations, the most skilled, who also have the benefit of ARH weapons (AMRAAM etc. ), will crank until their missile goes active, then drag and run away from their target for the remainder of the flyout in order to maintain distance and attempt to defeat the inevitable BVR counter fire. This tends to result in avoiding visual range combat as much as possible. This doctrine setting is also accessible through Lua (ScenEdit_SetDoctrine, parameter "bvr_logic"). * Tweak on passive sonar calculations: The diesel "noise penalty" (for snorkelling subs) now depends on the submarine's speed fraction (ie. desired speed vs max speed at the current depth), instead of being an "all or nothing" noise boost. If the sub is stationary then the diesel noise is minimal; at creep speeds the noise is still very small but rises sharply (by power of 2, in fact) as the speed increases, up to a maximum addition of 15db to the baseline noise figure. ^ Important gotcha: line breaks on the TLE text are performed using '\n', Lua's standard for line breaks. Also no extra spaces! The TLE format (and its parsers) is very specific on spaces between characters. * Lua: Added property "DesiredHeading" on Lua ActiveUnit wrapper and on AddUnit/SetUnit parameters (This solves the issue where static facilities placed via Lua will always rotate to North even if explicitly placed with another heading). * Lua: Added method GetBuildNumber that returns the current exe build version. Scen authors can use this info to alter Lua logic depending on feature availability. * Lua: Added method "SE_UpdateUnitCargo"
* SBR: Added any unit damage to the delta template. Users have asked about being able to carry-over damage and this could be used in that fashion. The Lua UpdateUnit() will then be able to apply damage to the unit. * New scenario attachment object type: Sound file. * Includes the current versions of the DB3000 & CWDB databases. * Includes updated versions of official scenarios & tutorials. * The tutorial scenarios now include the full series of "Uncle Mark's Tutorials". * Bart Gauvin's "Airstrike Tutorial" campaign is now included in the provided tutorials. * Includes a new "Flight Tutorial" tutorial series by Andrea Daolio. * Includes 4 new submarine tutorials by Apache85. Is there a list of the database additions/corrections somewhere? Thanks for all the hard work, it is appreciated! Really great update! The changes to IR sensors, ARH logic and BVR doctrine will massively improve the air warfare! Does this mean you won't always have perfect knowledge of where inbound AAMs are? Great work, visual detection ambiguity is significant in close-in dogfights. We have managed to squeeze 3 more fixes in before the Desert Storm release, so we have rolled out a 1.15.2 update. Change list and links are updated in the opening post. Is it my imagination, or did you also make some MORE of the optional SPECIAL FEATURES active? I haven't studies which ones weren't active before and are now, but it looks like only COMMUNICATIONS JAMMING is grayed out. I thought that there were about three or four that were grayed out before. My game is telling me I need 1.12 patch that my version is to low?? Yet when I open my game it just version 1.14 build 998.?? My auto update will not work. But I've always done manually in past. Yet now patch says above. My version to low. Needs to be up to 1.12?? But again my game shows 1.14 when I launch and play. After the 1.15.1 update my game is stuck in gods eye mode. If I try a munal attack I get the message "you cannot order an attack in gods eye mode"
Have opened the save game in editor and normal play and get the same mesage. trying to download the 1.15.2 update but no luck getting that downloaded so far. The God's Eye fix is simple: Go to Game - Options - Map Display & untick 'Use personal map preference'. That should do the trick. As for the downloads, what's your AV and did you try the FTP link as well as the Members Area link? unticking the personal map pref did the trick thanks, got the download in the members area, it was the FTP that wasn't working. Solved. Did full reinstall of 1.14.